In 2014, four offshore wind farms were granted consent in the Forth and Tay region – Neart na Gaoithe (450MW), Inch Cape (784MW), Seagreen Alpha and Bravo (1,050MW). The decision by Scottish Ministers to grant the consents was legally challenged by RSPB Scotland, an environmental NGO, based on concerns regarding the cumulative risk to seabird populations from collision and displacement. The case was heard in Court of Session, Edinburgh, in 2015, and the judge agreed with the case put forward by RSPB, concluding that the requirements of the environmental assessment processes were not met, including a failure to consult properly and misuse of appropriate assessment. 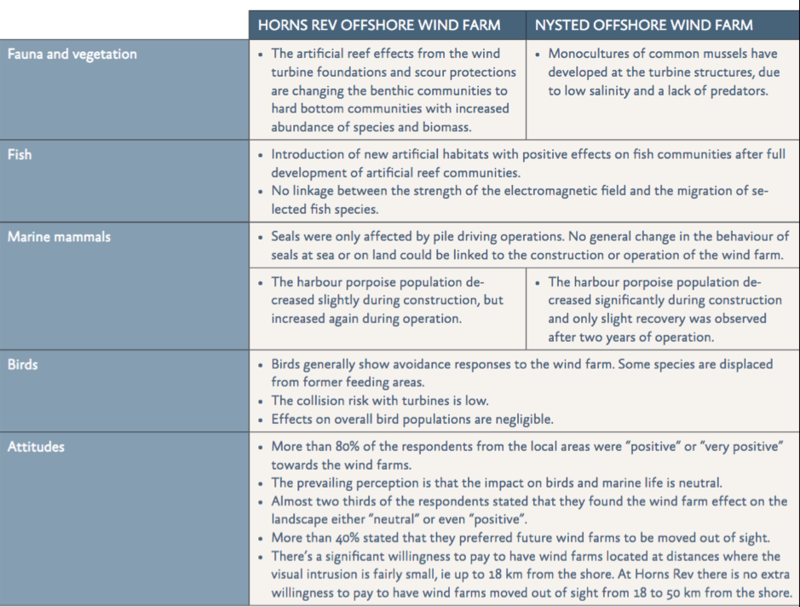 Conflicts between offshore wind farming and area-based marine conservation mostly arise on account of noise disturbance and displacement. Noise pollution during the construction phase. Noise disturbance during the construction phase can lead to changes in the behaviour of a range of sea animals. Research in Germany and Denmark confirms that porpoises temporary migrate to other areas during pile driving, but that population density returns to normal after the pile driving is finished. Noise pollution during the operational phase. Some species of offshore seabirds avoid areas where OWFs have been constructed and neighbouring areas. Mammals such as porpoises, bottlenose dolphins, Northern Right whale, harbour seals and baleen whales can be disturbed by specific frequencies of underwater noise. Other impacts on birds. Apart from collision, the erection of offshore wind turbines may affect birds as follows: (1) short-term habitat loss during construction, (2) long-term habitat loss due to disturbance by turbines, (3) formation of barriers on migration routes and (4) disconnection of ecological units, such as roosting and feeding sites. Cumulative effects may arise in connection with other pressures on birds (such as shipping). Ecological damage to the sea floor. 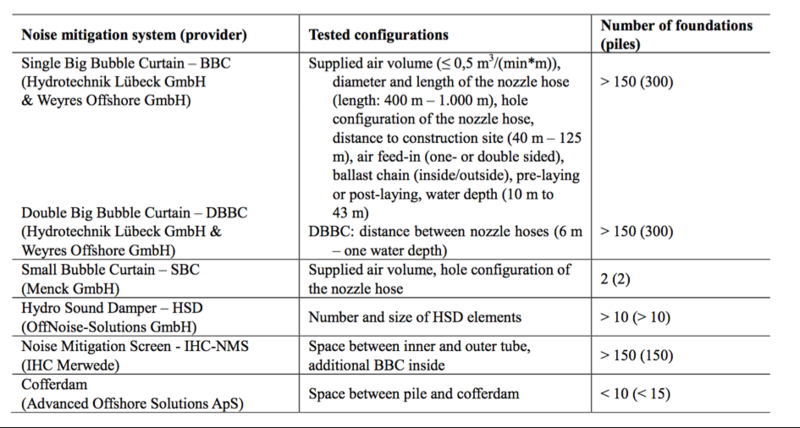 Offshore piling and cable laying also influence the sea floor. For fish and fish larvae, pile driving can have a negative effect, but recent research found this to be extremely small. Electromagnetic fields seem to have minor effects on certain fish species. The key drivers for the expansion of offshore wind farming are the renewable energy objectives set by Member States and the increasing size of offshore wind farms, including larger turbines. International environmental policy sets out ambitious targets for area-based marine conservation. The Aichi targets for the Convention on Biological Diversity stipulate that by 2020, 10% of marine areas, especially those of high biological and ecological significance, should be managed as protected areas. Other political drivers include the UN Sustainable Development Goals, especially Goal 14 “Life under water”, as well as EU-wide and national biodiversity and climate polices. The Marine Strategy Framework Directive’s Descriptor 11 specifies that “Introduction of energy, including underwater noise, is at levels that do not adversely affect the marine environment”. There are also species-specific conservation targets at the population level. Uncertainty remains a key driver of conflict, as a precautionary approach may dominate in the absence of sound knowledge. This is particularly the case for cumulative effects of human activities, where offshore wind farming may only be one factor among many. Public perception may also be a driver of conflict as species protection can be an emotional issue. At the same time, public opinion in many countries is in favour of renewables, which may increasingly also include offshore wind. 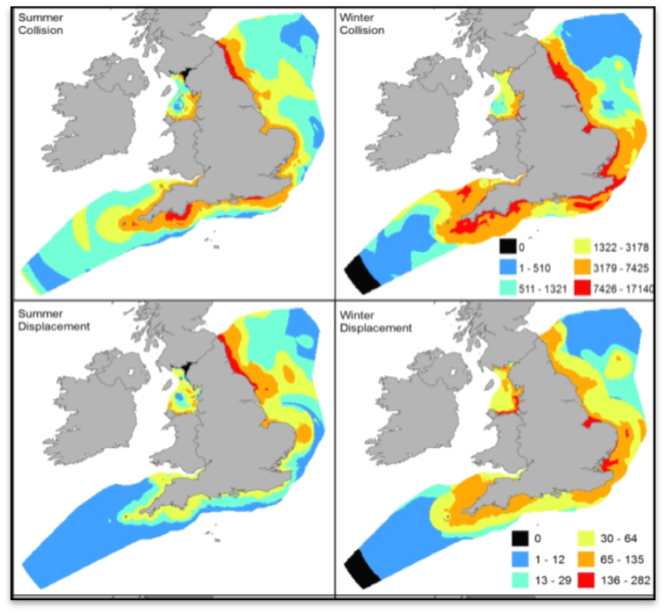 Sensitivity maps can help to understand the ecological value of marine areas. In 2014 a new GIS tool, called SeaMaST (Seabird Mapping and Sensitivity Tool), was commissioned by Natural England and the Marine Management Organisation in the United Kingdom, which maps sensitivity of seabirds to the wind farm impacts of collision and displacement in English territorial waters. These sensitivity maps are able to inform marine spatial planners and can be used by developers and statutory agencies alike. The maps provide information on existing knowledge of seabird distribution and the confidence associated with that knowledge for Environmental Impact Assessments and contextualise the significance of potential impacts. Aa seasonal restriction on pilling activity (construction permitted between 1 July and 31 December). In Belgium there is advice not to pile between January 1st and May 1st. Adjusting the parameters of the pile stroke. Prolonging the impulse not only reduces the sound level, but also shifts the maximum of the acoustic spectrum to lower frequencies, which are less harmful to marine mammals. This is often done by vibration pile driving. Both methods are mutually independent, meaning when used in combination, they add to each other. An important consideration is the frequency of the sounds which is blocked by the sound barriers. While the main barriers might block high frequency sound, low frequency sounds may continue to spread, affecting animals using these low frequency sounds for echolocation and communication. Another problem is that effective noise mitigation strategies and tools are expensive. Noise reduction measures in a recent developed wind farm in Germany added up to 40 million euro, which makes that costs this can become 15% of the total installation expenses. While there are several knowledge gaps in the ecological impact of OWF, knowledge gaps also can be found in the positive effects of OWF on the environment. These synergies can be fostered through multi-use development. Research has stated that the most beneficial placement of an OWF to act as an MPA would be in an area of degradation. OWF installations in the past have been able to restore damaged ecosystems and increase biodiversity almost operating as an MPA unintentionally. While the environmental effects are often largely unknown and site specific it is of an added value to develop an environmental monitoring programme of a new wind farm development, analyse the effects and take site specific actions. The monitoring programmes could also provide new insights on the environmental impact for future wind farm development. During the period 1999-2006 a comprehensive environmental programme was carried out in order to evaluate the environmental impact of two of the biggest offshore wind farms in the world situated in Denmark: The Horns Rev Offshore Wind Farm and the Nysted Offshore Wind Farm. This programme found several impacts on the environment, but also states that appropriate siting of wind farms is an essential precondition for limiting negative impacts on nature and the environment. This means that there is indeed a possibility to engineer on OWF in an environmentally sustainable manner that does not lead to significant damage to nature. Besides monitoring programmes focusing on specific development sites, several countries have developed more comprehensive ecological research programmes. These programmes have a multi-annual research programme focussing on newest findings and developments, and provide budget for research institutes to conduct the research in the field. The United Kingdom has developed a Strategic Environmental Assessments (SEA) research programme, which funds a significant number of marine research projects to improve the information base for undertaking strategic assessment and support activity specific consenting. 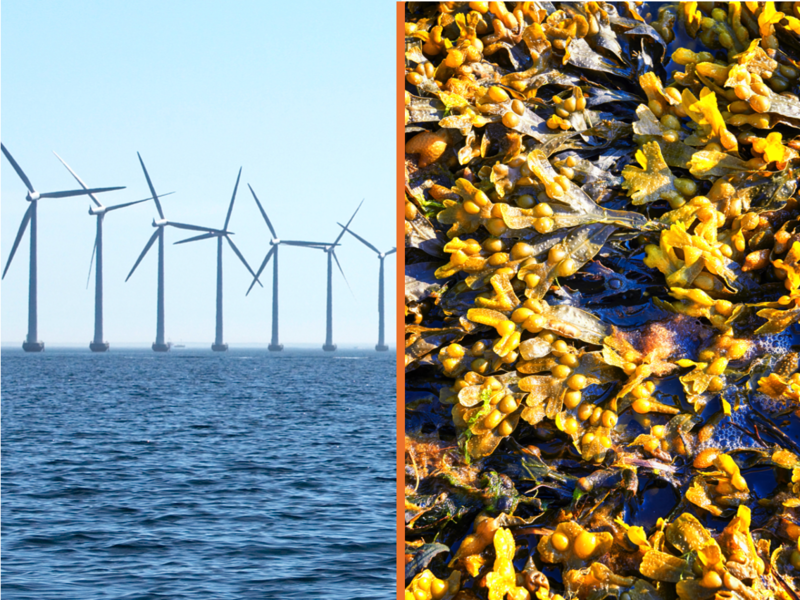 In the Netherlands, the 5 years long WOZEP (Dutch Governmental Offshore Wind Ecological Programme) programme has started in 2016 to fill the knowledge gaps around the ecological effects of offshore wind. Monitoring underwater noise can be extremely challenging and the costs of these survey techniques have to be balanced with the added value of gathering this information. However, in recent years, the technology available for monitoring underwater noise and marine mammal presence has improved dramatically, with several affordable and good quality instruments now readily available. This means there are now multiple ways in which surveys can be conducted, depending on individual needs. Most importantly, instruments are now available that allow the monitoring of sound underwater both short and long term, autonomously or from a boat, and allow real-time data transmission to a remote location.